The Alan Blueford Center For Justice is on Twitter! Posted on November 19, 2014 by missmollie33 | Comments Off on The Alan Blueford Center For Justice is on Twitter! Comments Off on The Alan Blueford Center For Justice is on Twitter! Huge Thanks To Brian Reems For Singing This Beautiful Song To Our Mothers. #HH2H Helping Hearts 2 Heal is about/for mothers who have experienced loss, however, this loss does not have to be specific to a child, for example, this conference is also intended for Patricia DeSantis, who thankfully has her children, but her husband was murdered by Santa Rosa PD. This conference is also for people like Al Osorio & Tracey Bell-Borden who work closely with a mother who has experienced loss, Denika Chatman’s son was murdered by SFPD. When they say, “it takes a village to help raise a child”, well the same is true to help a mom/family who has lost a child, or a loved one, “it takes a village”. Together we can ascend past our pain and begin the process of healing so that we can reclaim our power as Mothers. The 1st annual conference for Mothers: Helping Hearts 2 Heal is this Sat Oct 25th 9am-3pm–LUNCH IS INCLUDED, THE EVENT IS FREE FOR ALL TO ATTEND. Speakers include Rosemary Duenez, Wanda Johnson, Jeralynn Brown-Blueford, Author Dinyal New, Anne Weills, Dr. Siri Brown, Rashida Grinage, Dr. Paula Clark, & more…. The event is graciously being hosted by Center Of Hope Community Church. This will be a day dedicated to healing and empowerment! Together we can ascend past our pain and begin the process of healing so that we can reclaim our voices and resources to establish a national program agenda for the empowerment of mothers/families to become agents of change in our community. Jeralynn Brown-Blueford is the mother of Alan Blueford. On May 6, 2012, Alan was unjustly murdered by an Oakland police officer. Jeralynn has not stopped fighting for justice in her son’s name since the day he was taken from her and from this world. A large part of Jeralynn’s work towards justice is dedicated to helping to bring unity & healing to the community, especially the community affected by racial profiling & police terrorism. 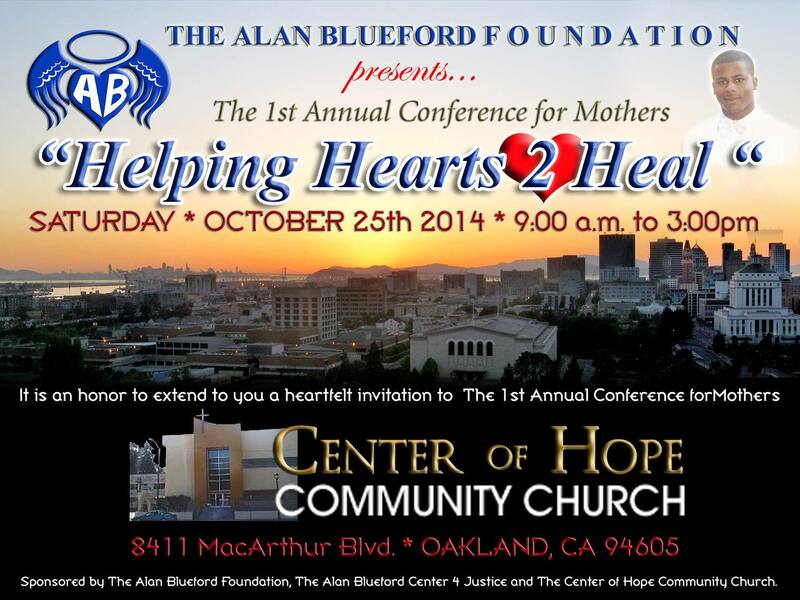 This conference is the official kickoff for The Alan Blueford Foundation, a non-profit dedicated to doing exactly what Helping Hearts 2 Heal is about, “the empowerment of mothers/families to become agents of change in our community. The conference is free for all to attend, however, we are asking for a suggested, not mandatory, $10 pre-registration fee so that we are able to determine how many guests to accommodate, lunch will be included at the event. We are also encouraging you to donate to this fund whether or not you can attend the conference, all proceeds will be used towards event related costs which we are budgeting to be $5,000. Any amount raised above & beyond our financial needs for the conference will be the start money for The Alan Blueford Foundation whose goal, put simply, is to help heal the community, especially the community affected by racial profiling & police terrorism. FIND OUT WHAT IS HAPPENING IN YOUR CITY & PLEASE SHARE! 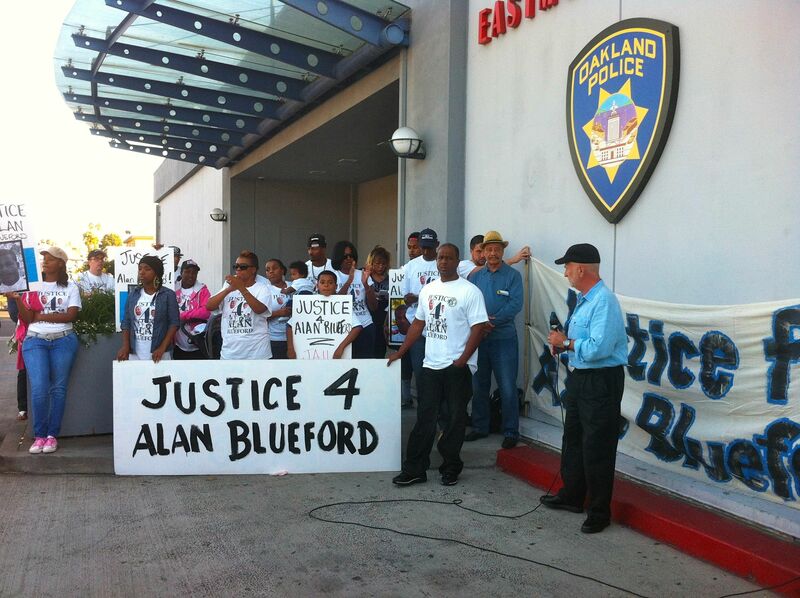 Dan Siegel speaking out against the injustices surrounding Alan Blueford’s murder by OPD officer Miguel Masso. The Alan Blueford Center For Justice endorses Dan Siegel for Oakland for the next Oakland Mayor because he has walked his talk for his entire life which led him to be one of the Blueford family’s lawyers standing up to the injustice & corruption in Oakland City Hall who is under the leadership of Oakland Mayor Jean Quan. When the Oakland City Council & OPD were actively covering up the outright lies told by [former] OPD officer Miguel Masso & perpetuated by [then] OPD chief Howard Jordan about the details of Alan Blueford’s murder, Dan was leading the fight for Justice 4 Alan Blueford & to stop racial profiling & to end police terror. Click the link to learn more about Dan, and please share! 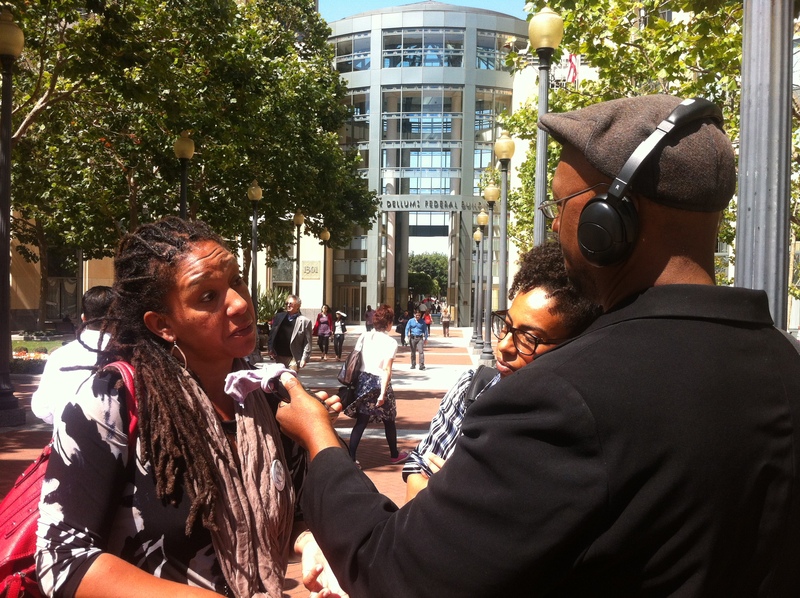 photo credit Mollie Costello @missmollie33, the photo is taken outside of the Oakland Federal Building during an interview with Davey D Cook from Hard Knock Radio. With the eyes of the world on Ferguson and the protests around it an array of issues have popped up around police militarization, holding police accountable and police brutality/ terrorism. The response Ferguson youth had to the killing of Michael Brown has resonated with so many because it reflects what many are experiencing and feeling. With that being said, many are on the ground both in Ferguson and in their respective communities all over the country organizing and strategizing as to what’s the next steps? Some are organizing patrols, armed with cameras and information about people’s rights when stopped by police. Others are putting together workshops to train people on how to best deal with police. Still others are seeking redress through the Department of justice or civil lawsuits. Others are pushing to have laws in place that require police to wear cameras at all times, while others are pushing to end the Policeman’s Bill of Rights which among other things allow them to keep their names hidden from the public after they kill someone. Still others are demanding that there be a defunding of and removal of all this military hardware the departments are purchasing. Among the array of responses to this a number of folks who have been working on police accountability issues have decided to pay local and national lawmakers a visit and push them to see what they intend to do about all the police killings. Will they be holding hearings? Will they be crafting laws on behalf of the people most effected? Will they be pushing for independent investigations? Many of us already have sets of demands that have been developed over the years which need to be presented and followed up on..
Last week in California a new law AB 2634 (Bradford) was signed by Governor Jerry Brown. This measure will strengthen legal remedies available when a person is the victim of police abuse and basically allows folks to sue to put an injunction on entire police department where there are patterns of abuse. Formerly incarcerated folks along with a number of forward thinking legislatures and organizations, worked quietly for two years to get that bill passed in a state that has some of the most powerful police unions in the country. Big shout out to George Galvis and the team of folks he worked with to help make this happen.. needless to say there was not a word of this in the press.. George came on Hard Knock Radio – 94.1 to speak on this and all the steps they took to get this accomplished. Last week a number of us including Cat Brooks, Liz Derias, Mollie Costello, and Ghetto Prophet decided to put a flip on the concept of lobbying and the popular Ice Bucket challenge and have challenged activists, concerned citizens and artists to pay a visit to local lawmakers in their area and put some demands on them..This week members of The Alan Blueford Center for Justice, Malcolm X Grassroots Movement, and ONYX went to Congresswoman Barbara Lee’s office to see what additional steps she has a congress person can take to defund money given to police departments that lead to them buying military equipment..
We thought that was interesting Honda and members of Congress could push for a national bill to help police , but in the wake of all these unarmed Black and Brown folks being killed there hasn’t been any sort of movement from the Progressive Caucus or the Congressional Black Caucus. We wanted to know what steps she is able to take to put an end to this? Lee’s office was given a number of suggestions including having special prosecutors who only deal with police abuse cases and have no day to day interaction and working relationship with police as we exists now with DAs all over the country. We also know that the Fraternal order of Police are pushing to nationalize the Policeman’s Bill of Rights.. the delegation who visited Lee laid out all the ways in how the POBR in California has been abused.. Liz Derias of the MXGM noted how difficult it was to get information on police killings from the police departments who use these laws to keep information hidden and out of the hands of the public. In fact the POBR make the new law that Galvis and his folks got passed difficult to be enforced. It was iemphasized that needs to change..
A follow up meeting will be had.. It should be noted when we showed up at Lee’s office the federal guards downstairs tried to redirect us by telling us The office was too small for them to meet with 5 people. That was interesting assertion considering I and others been to office in the past with more than dozen people.. When we got up to the office, one of her staffers said we need to go on the website and make an appointment. We felt that was inappropriate as constituents who live in her district who all came over on their lunch hours to express grievances..We asked to meet with someone now.. They accommodated us.. This is important to note because many are now starting to go see lawmakers in the wake of Ferguson. There are folks saying that other steps need to be taken other then marching.. Well if those steps include meeting with lawmakers, then it will be noted and documented those who make it difficult to visit. In the spirit of the Ice bucket challenge after our visit a number of other folks and organizations were challenged to go visit lawmakers and lay down demands they wanna see put in place to end police terrorism.. We are calling it the HANDS UP DON’T SHOOT CHALLENGE.. The Alan Blueford Center For Justice stands with The People against Urban Shield & the increased militarization of OPD & PD’s across the nation & globe from #Oakland2Ferguson2NYC2Palestine. These are a few photos to document the community uniting to stand against police terror resulting from the over-militarization of the police…as well as racial profiling & economic inequalities, but the Urban Shield conference that comes to Oakland every year is about militarizing the police. We have all experienced similar circumstances of loss and pain. During the Mothers Helping Hearts 2 Heal Conference we will be coming together with mothers and family members within our communities who share the same experiences and the same pain. Helping Hearts 2 Heal is about/for mothers who have experienced loss, however, this loss does not have to be specific to a child, for example, this conference is also intended for Patricia DeSantis, who thankfully has her children, but her husband was murdered by Santa Rosa PD. This conference is also for people like Al Osoria & Tracey Borden-Bell who work closely with a mother who has experienced loss, Denika Chatman’s son was murdered by SFPD. When they say, “it takes a village to help raise a child”, well the same is true to help a mom/family who has lost a child, or a loved one, “it takes a village”. Another clarification about the agenda for the day, while the conference is about loss in general, having a child/family member murdered by police compounds/complicates loss, so there will be some stuff specific to that at the conference, however, that is not the only focus. The Alan Blueford Center For Justice (ABC4J) & #Justice4AlanBlueford stands in solidarity w/the Lopez family & their supporters…who are apparently A LOT of youth! Click on the photo to see the entire album from ABC4J.